To grow seedlings and plant it in the garden or in the greenhouse - not enough for a good harvest. To cucumbers and tomatoes on the bushes were many, it is time to pinch back the suckers. If this is not done, instead of fruit you get some leaves and stems. Tomatoes come in determinate and interdeterminate. That is, short and tall. And depends on how to grow them. Undersized tomatoes to form 2, sometimes three of the stem, removing all the shoots in the leaf axils. Tall tomatoes are usually grown as a single stem, while also off all side shoots. 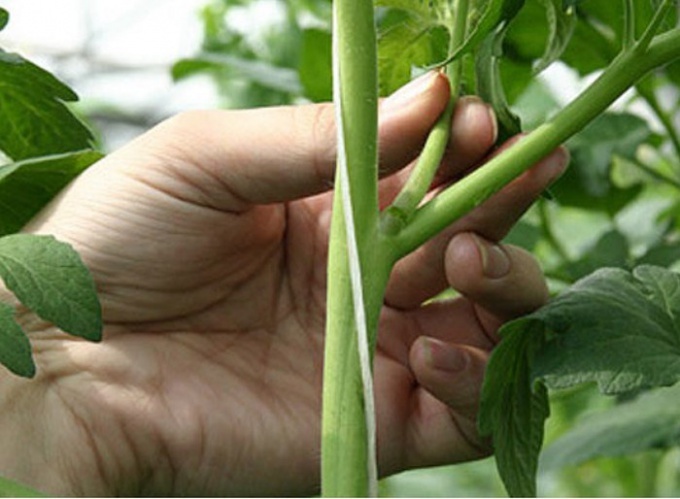 Pinched do to achieve stepson 4 cm, cutting or breaking off not at the stem, leaving a stump of 0.5 cm These measures are needed to ensure that a sprout has not appeared again. If the stepchildren leave, soon they will grow and will turn into stems. Such pressure on the Bush tomato for anything, as a result, the plant is not getting enough nutrients and fruits are not fastened. If you want to grow a tomato stem in two, leave one strong stepson. Note, there are determinate varieties of tomatoes that do not require pinching. Cucumbers also require a special form of a whip. Of course, you can let it go, soon the Bush will grow, cucumbers will be, but the overall harvest is reduced. And in the greenhouse plants will not be enough space and light, so will quickly rot and scourge will die. Cucumbers form a single stem. There are several methods, one of the well-proven is pinched according to the following scheme. Remove all side shoots, in the axils of poyavlyalsya, until the fifth leaf. Take ovaries too. Be sure to tie the stem to the trellis with soft twine. Do not tighten the knot, because as a plant grows, the twine will crash and will hamper the supply of nutrients from the root. In the axil of the fifth leaf sixth and seventh Express shoots (one), and when they will appear on the first sheet, presidnete. After tying cucumbers leave one good fruit, everything else (flowers and ovaries) remove. In the axils of the eighth and ninth sheet leave alone run with two leaves and two ovaries. Don't forget to secure the top main whip for the cord. The shoots can be pinched with your fingers and can be cleanly cut with scissors. Next place already on 3 side shoots, in three sheets, and three ovaries. If the greenhouse is low, the plant after the appearance 11-13 sheet reaches the wire, stretched under the ceiling. So wrap the stem around the trellis and wait until he will not grow up to 40-50 cm, then presidnete the top to stop growth.